Lake trout are a species of char with a wide distribution in the cooler northern regions of North America. They are found throughout Canada, from the Atlantic provinces to the Great Lakes and all the way to the West Coast, including in the Rocky Mountains. Lake trout are also found quite far north, even occurring on arctic islands. They tend to prefer cold water (about 10 degrees Celsius), and live mostly in large, deep lakes, though occasionally they are found in shallower bodies of water and large rivers. Lake trout resemble other char or trout in shape, with a fairly elongated body, a large mouth and an indented tail. Their coloration varies from olive to grey or brown, dappled with white or yellowish spots. Normally they are darker on their dorsal side and lighter on their flanks, becoming white on their underside. Lake trout can grow to nearly a metre in length and weigh more than 20 kilograms, but they average 38 to 51 centimetres and 4.5 kilograms. Lake trout often live to more than 20 years of age.Their diet varies based on the length, weight and age of the fish, but includes small crustaceans, snails, leeches, insect larvae and other small fish. Due to popularity among anglers lake trout populations can be decimated and they need to be supported by stocking programs. 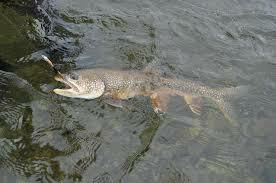 Lake trout prefer to live in large lakes that are deep with cold water. 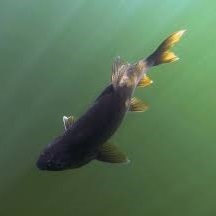 Generally they spawn during the fall season, but this can be affected by the location of the lake and weather patterns. Juvenile trout are reclusive and will seek out deep water where they feed on plankton and other small aquatic prey. Lake trout are easy to distinguish from other trout by their color variation, which is usually yellowish to white spots on their dark green to greyish body. They have an elongated, stout heads like all other trout. Their belly is white and at times can have an orange-reddish color paired fins. By using light line, the line has less friction with the water and slices through so that your line goes down to the bottom without having lots of line out. Tie two 3-foot pieces of line to your three-way swivel. Use a 1 or 2-oz. weight on one line and a light lure on the other. Lake Trout like small lures more than big lures. The very best lure is a small South Bend Kastway Trophy Spoon. You can also use #1 or #0 Mepps, Panther Martins or Blue Foxes. Small Cleos or a small Mepps Cyclopes are also good. You only want to move just fast enough for your lure to work and no faster. If your boat is moving too fast, it will be very hard to find the bottom of the lake. If you are using a boat with a bigger motor and it's hard to keep slow, try back trolling or maybe install a trolling brake. Summer --> Summer is the tricky part. Many believe that the Lake Trout go to the deepest part of the lake and stay dormant. In actual fact, the Lake Trout stay suspended in 53° thermal layers or concentrate in shallower holes where a natural spring pumps cold water into the lake. Why are they there? That's where all the baitfish are. There will be trout deeper then 60 feet or on the bottom in the deepest part of the lake but they are not feeding. When they do feed, they come shallower. Ok, the real reason why you’re reading this section is to get tips on catching Lake Trout. Below you’ll find such fishing tips that I put together. I searched high and low on the internet to find the most successful lake trout fishing tips, that have been tested and have proved their merit. 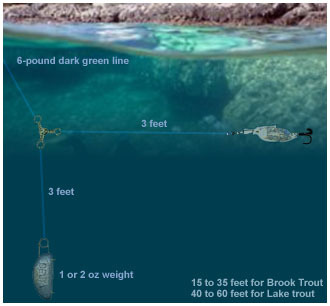 Depth is Important – The depth at which you fish for lake trout is very important. They tend to like cold water, so you need to go deeper as you get into the warmer seasons. After the ice-out you want to be between the surface and 10′. In mid-spring you should be about 20′ to 30′ feet deep, while in late spring about 30′ to 45′ deep. The summer is difficult to determine because they like to stay in the thermal layers that are at around 53 degrees F or in shallow holes where cold water is pumped into the lake by a natural spring. Lure Selection 101 – The type of lure that you want to use when fishing for lake trout will vary based on a number of factors. The average size of the lake trout population, depth, the season and available bait fish are very important. Always try to select lures that mimic native bait fish and talk with local tackle shop employees and fellow anglers to get an idea of what fishing gear works where you are fishing. We recommend using spoon lures, specifically the South Bend Kastway Trophy Spoons. Odds Are in Your Favor – Generally lake trout tend to stay in the same area, even though they aren’t schooling fish. The odds are that if you catch a lake trout in a specific area then there are likely to be more nearby. Stay in the area where you’ve caught one and you’ll most likely catch another. Best Live Bait Options – When it comes to using live bait for lake trout nothing beats a good old fashioned night crawler. Along with night crawlers, medium to large size minnows and salmon eggs can also be very effective. Invest in a Fish Finder – While a fish finder is an expensive piece of equipment it can greatly increase your odds of finding monster lake trout. You’ll be able to find schools of bait fish and/or figure out what depth the trout are sitting at. This is only useful if you’re fishing from a boat. Well, if you’ve read this entire web page I'm hoping you got some good lake trout tips and information to help you catch more trout. Perhaps you’d like to learn more about them and need additional resources, hence why I created this section. Below you’ll be able to find some external resources related to lake trout fishing. The Orvis Guide to Prospecting for Trout – This is a comprehensive book that has a lot of useful diagrams and photos. It’s certainly helpful for beginners, but experienced anglers can gain value from it as well. Trout Legend – Forum – An excellent community of anglers who love to fish for lake trout and all other types of trout. A great place to meet some friends and learn some new tips.